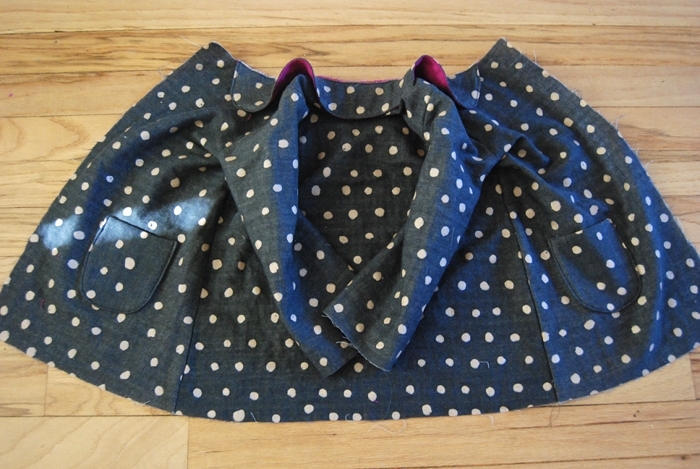 I’m re-posting this Reversible Spring Coat tutorial that was originally up on iCandy Handmade for their Basic Bodice Series. The premise of the series was that if you have a great bodice pattern and some ideas for mixing it up, you can pretty much make anything! So I decided to take a basic dress bodice and turn into a reversible coat! It’s going to take a bit of pattern altering, of course, but I’ll walk you through it and it’ll be pretty simple! 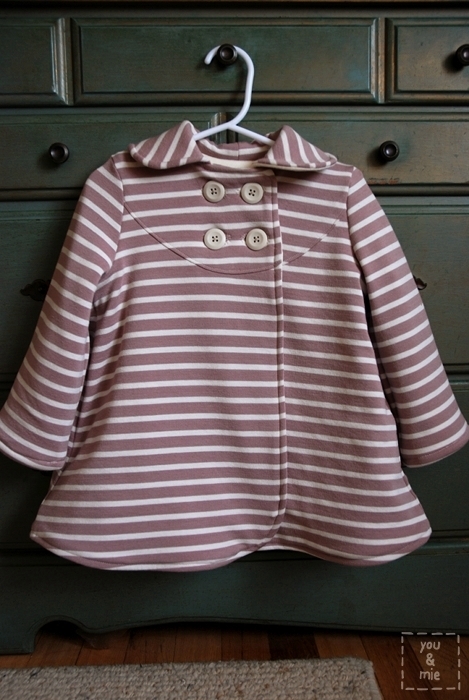 And the finished product will be a sweet and practical coat for your little one! I used 2 lightweight fabrics (nani iro double gauze and linen) to make a spring coat since I know the weather will be warming up soon. 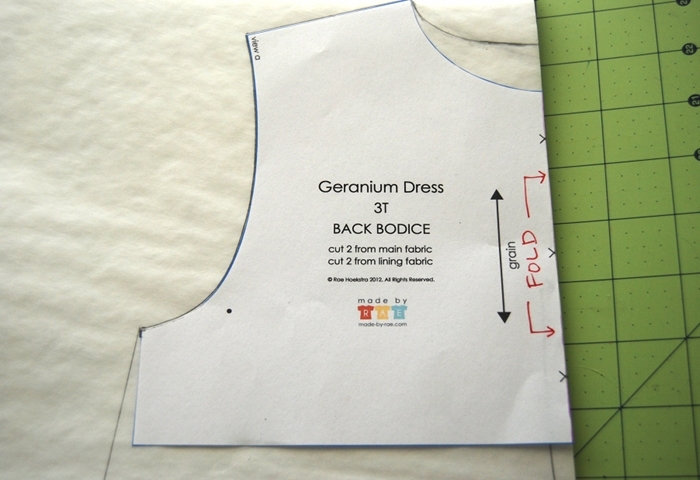 I started out with Made by Rae’s Geranium Dress pattern for my bodice because it’s the pattern I’ve been using for dresses recently, but you can use pretty much any basic bodice pattern. 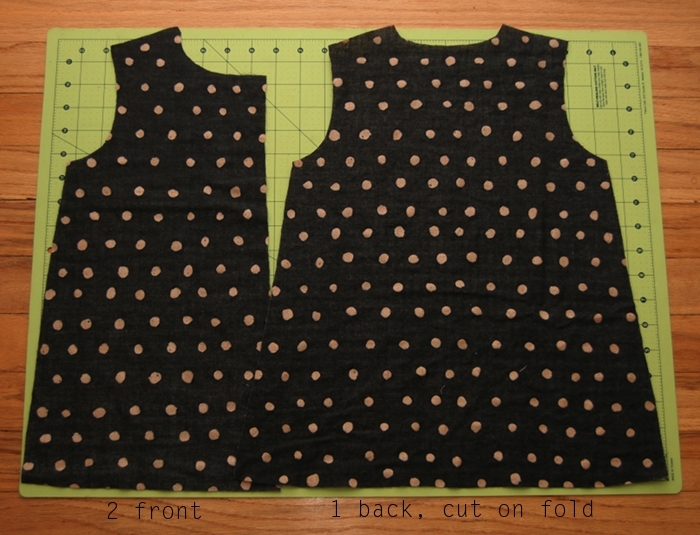 I went up one size because this is outerwear and I want it to fit over clothes, so instead of 2T which my daughter usually wears, I cut out the 3T size bodice pattern. The original pattern has the front bodice piece cut on the fold and a button placket in the back, but we want our button placket in the front and will cut our back piece on the fold. So, the first step is to cut the extra off the back bodice. Place the front bodice pattern on top of the back bodice pattern lining up the bottom of the armhole and bodice. Mark the fold line onto the back pattern and cut on the line. 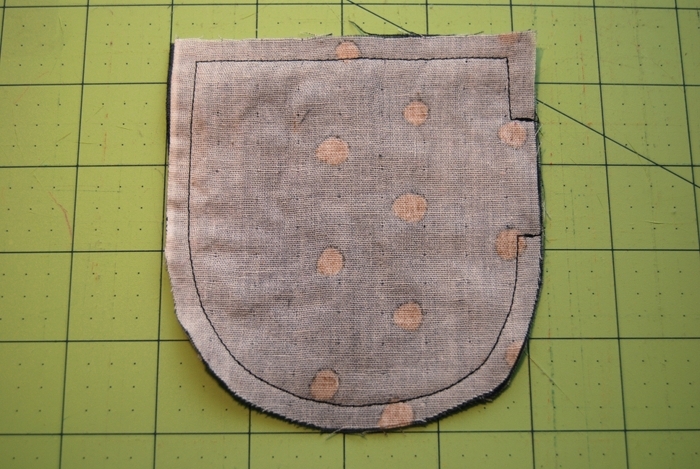 Depending on your bodice pattern, you may want to lower the bottom of the armhole. I trimmed off a bit starting from half an inch down. On your tracing paper, line up the straight edge of your back pattern piece with the edge of your paper and trace the shoulder seam and armhole. I raised the neckline so it hit about an inch higher at the fold line. From the bottom of the armhole, use a ruler to make an A-line shape for your coat. You can make it whatever length you want. The bottom hemline is slightly curved. For the front pattern piece, you’ll want to take another piece of tracing paper and tape it so it hangs over the straight edge of the back coat pattern by 1.5 inches (1/2 an inch for seam allowance and another 1 inch for the button placket). 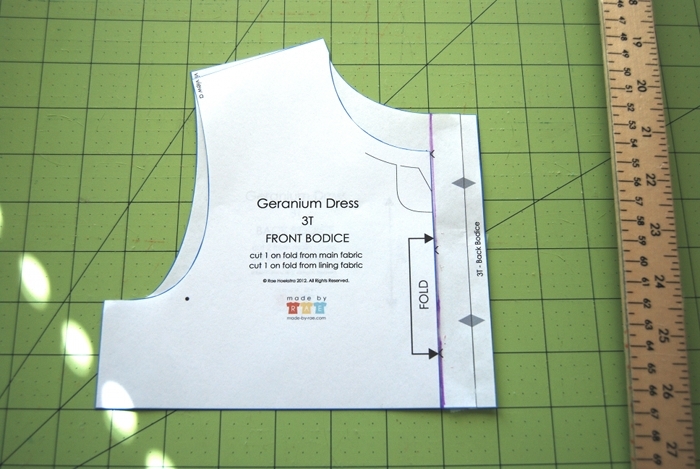 Place the front bodice pattern to top so that the bottom of the armhole and the straight edge lines up with the back piece. 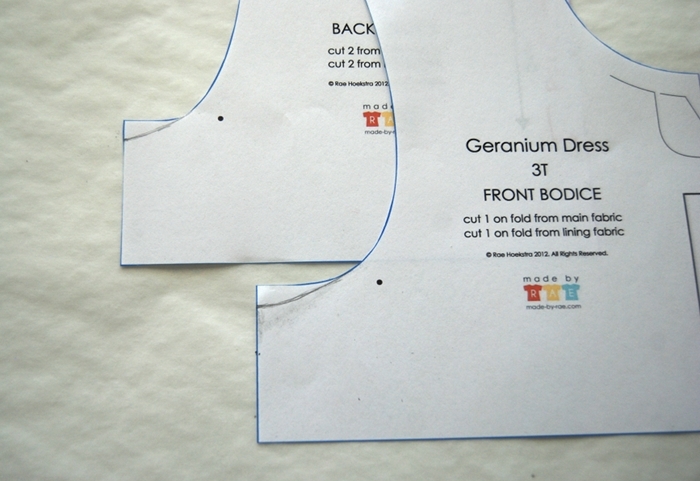 Trace the shoulder seam and armhole of the bodice pattern. I brought the neckline up by about 1/2 an inch. 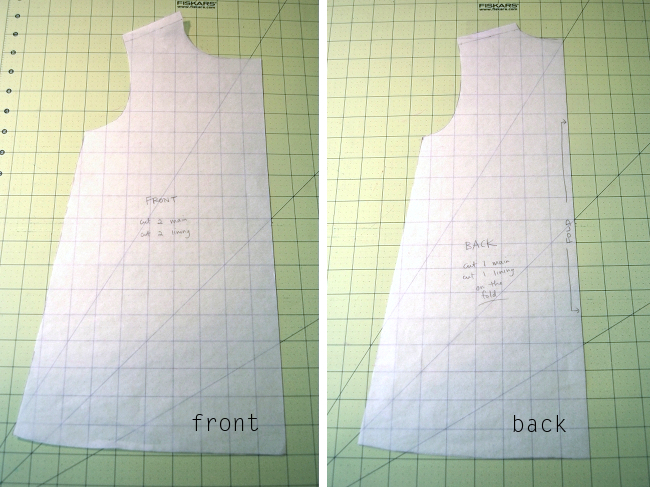 Remove the bodice pattern and trace the side seam and bottom hemline from the back pattern piece. Make sense? Here’s what my pattern pieces looked like. 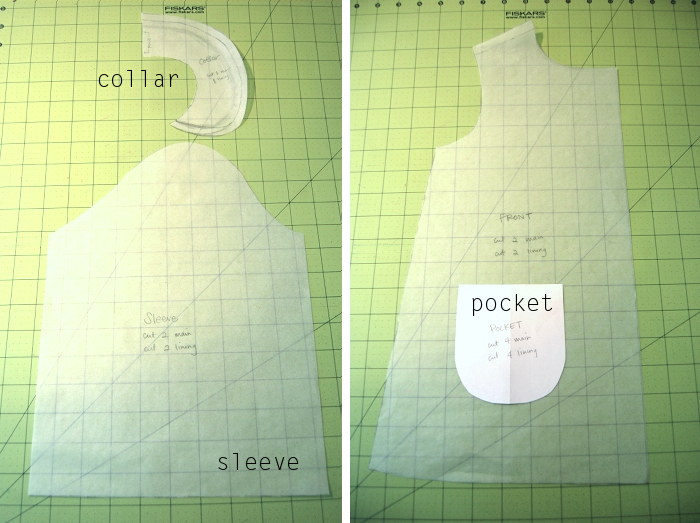 You’ll also need to draft a sleeve, collar and pocket pattern. For the sleeve, I actually used one that I already had. To make sure it’d fit, I cut a muslin of the sleeve piece and after I sewed the front and back pieces together of the coat, I checked to see if it would fit in the armhole, then adjusted the pattern as necessary. 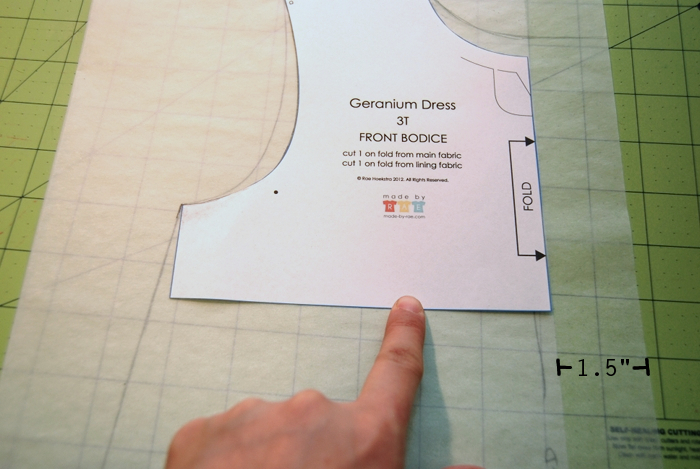 If you don’t have a pattern piece for a sleeve, you can find many tutorials for drafting your own with a simple web search. 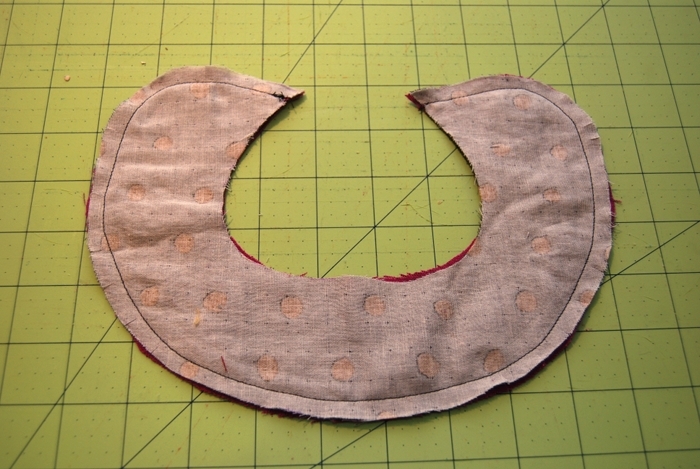 For the collar, I used this tutorial by Vanessa of LBG Studio. 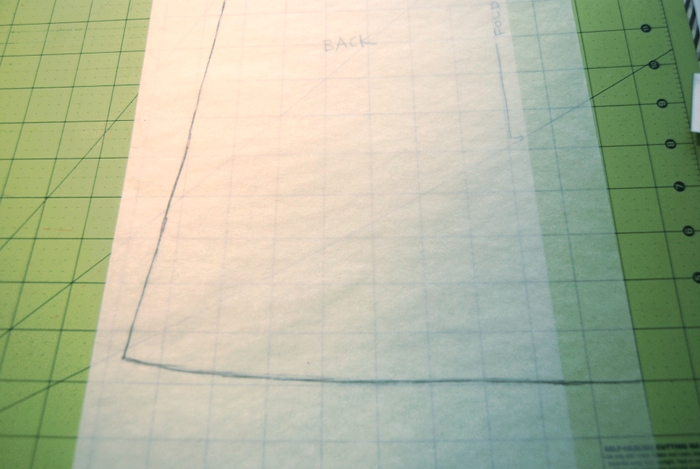 And for the pocket, I took a piece of paper, folded it in half and drew the basic shape that I wanted. Be sure to add seam allowance! And from Fabric B, you’ll need the exact same thing. Now we get to the sewing part! 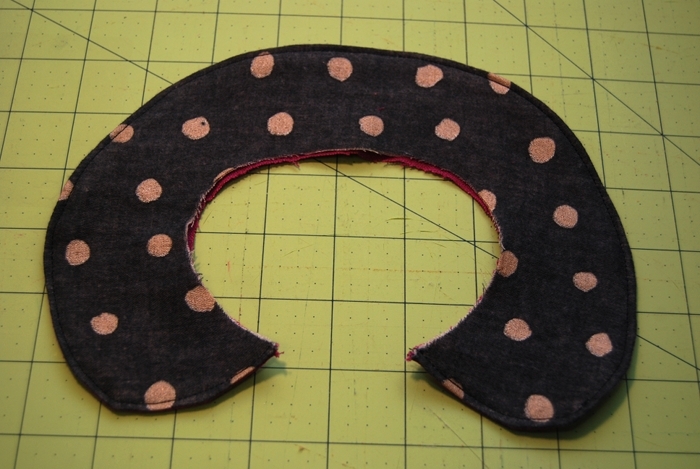 Place your collar pieces down (1 from Fabric A and 1 from Fabric B) with right sides together. Pin and sew the outer edge. 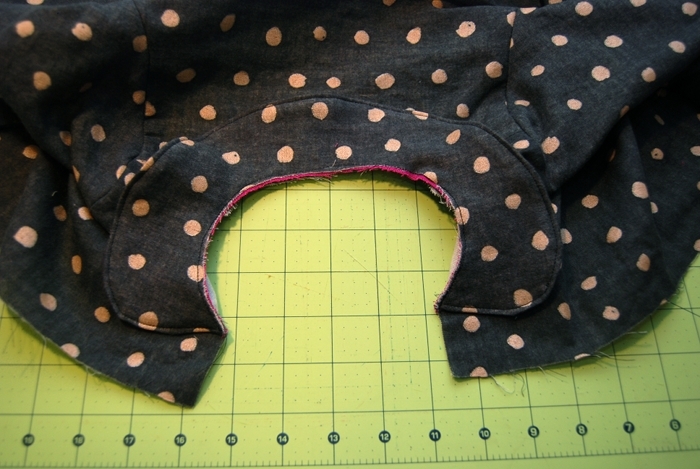 Clip rounded edges to reduce bulk when you flip the collar right side out. Flip right side out and press flat. Top stitch around the outer edge, if desired. Place two pocket pieces together (right sides together) and pin. Sew around the edge, leaving a 1 inch opening. I like to sew along the opening as well because it helps flip the seam allowance in when you turn the pocket right side out. 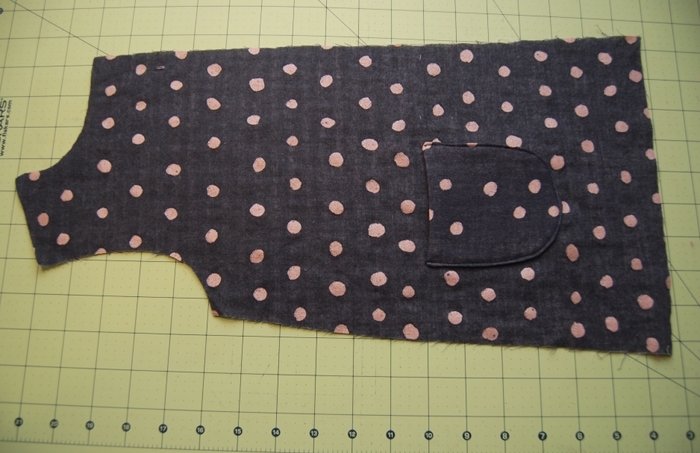 Flip the pocket right side out, press flat and sew onto one of the front coat pieces. Stitch close to the curved edge of the pocket, back stitching several times at the tops of the pocket to reinforce the corners (don’t sew the pocket closed!) 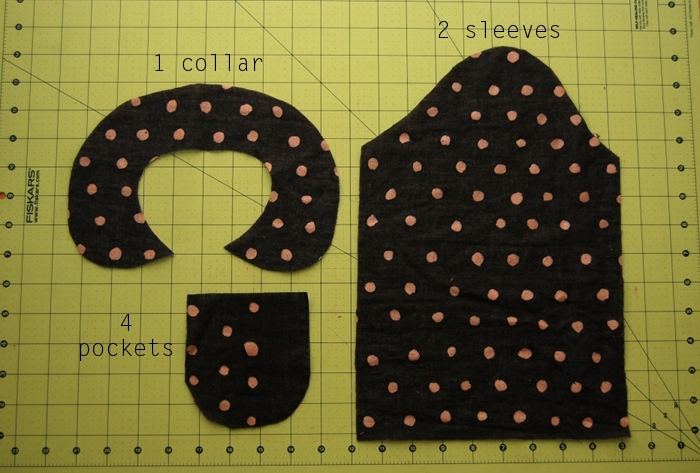 Repeat with the other 2 pocket pieces for Fabric A.
Pin and sew shoulder seams. Press them open. 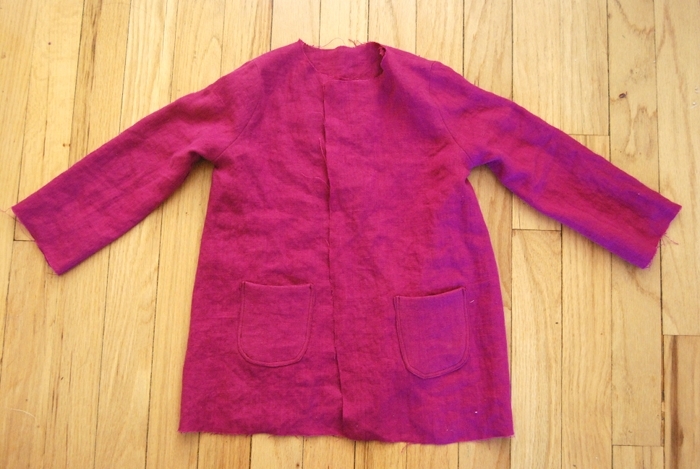 Open up the coat at the shoulder seam, right side up. 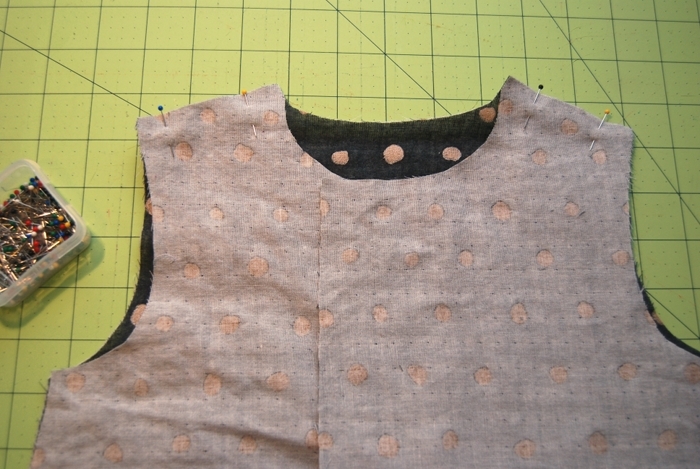 Find the center of the sleeve and pin that to the shoulder seam, right sides together. 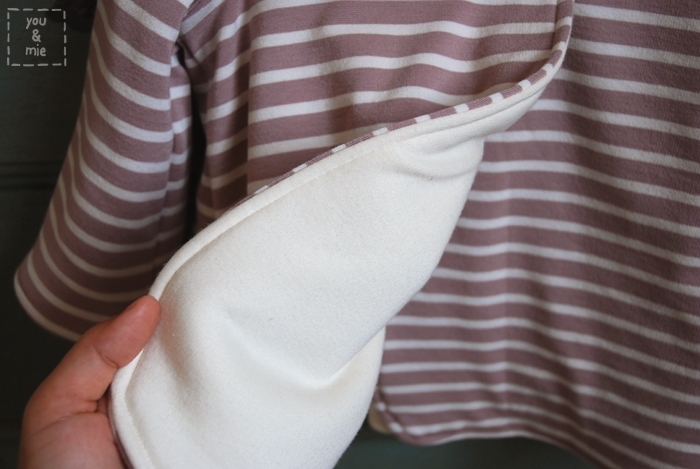 Continue pinning the sleeve to the armhole carefully. Sew and press seam. Repeat with other sleeve. Line up the side seams and the bottom of the sleeve, pin and sew (right sides together). Repeat with the other sleeve and side seam. Turn coat right side out and press. 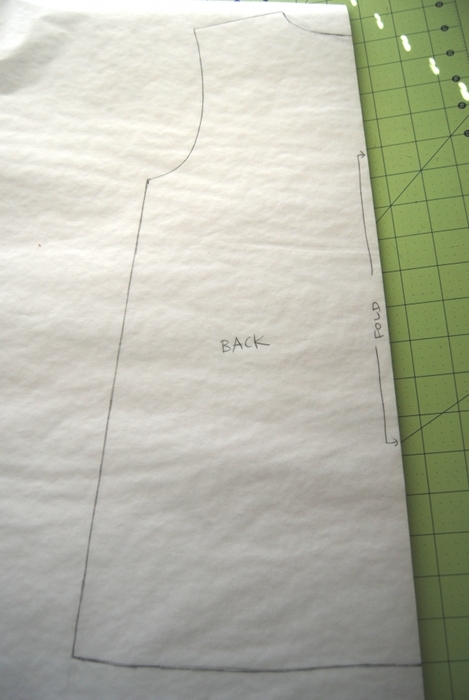 Take your prepared collar and line up the center with the center of the back of the coat. You want the right sides of Fabric A to be facing up for both the collar and the coat when you lay them on top of each other like this. 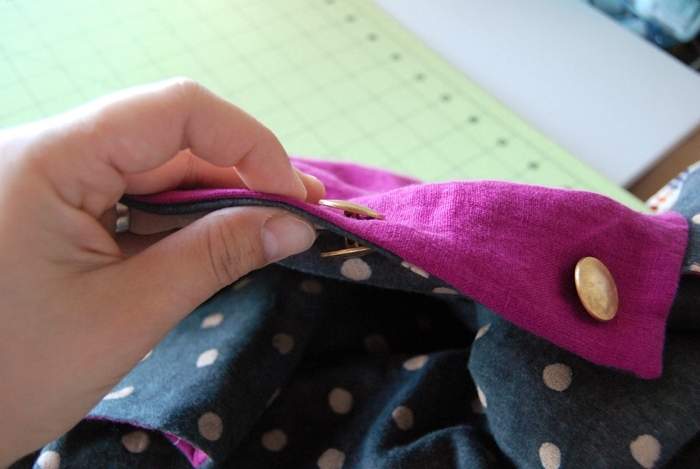 Pin the inner edge of the collar to the neckline of the coat. Baste the collar to the coat. Repeat all of the steps with Fabric B (except for basting the collar). 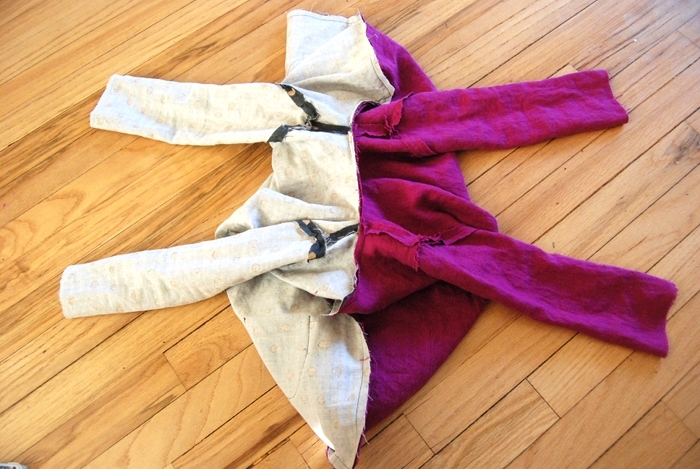 To attach the two coats, lay Fabric A coat down, right side up. Lay the Fabric B coat on top, right sides together. Sleeves should be on the inside. 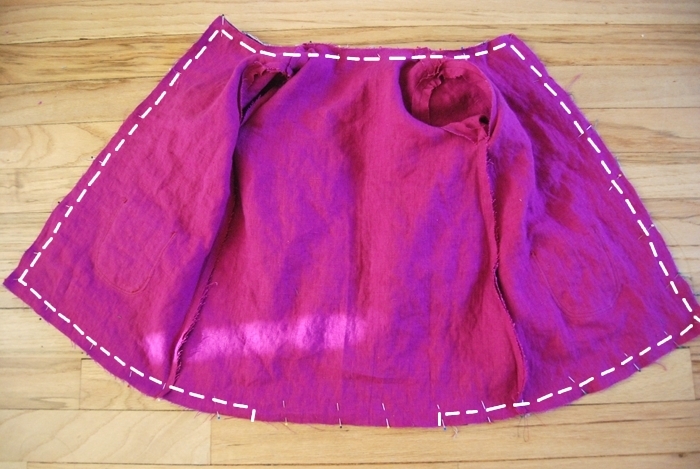 Pin the entire outer edge and sew together leaving about a 6-8″ opening along the bottom. Take one of the sleeves and fold it out (towards the wrong side) by about 1.5 inches. Slide it inside the other sleeve, line up the bottom seams of the sleeves and pin the ends of the sleeves together. 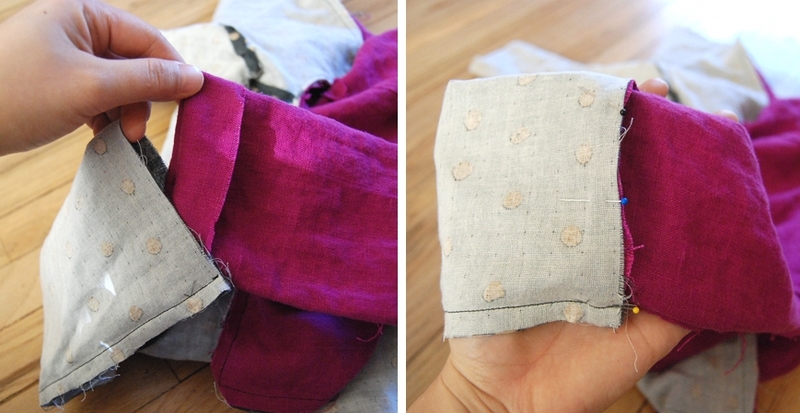 Sew the sleeves together along the pinned edge. Go slowly and untwist the coat to your left as you go along. Repeat with other sleeves. Flip the coat right side out through the opening in the bottom. You’re almost done!! Press all the edges of the coat out. 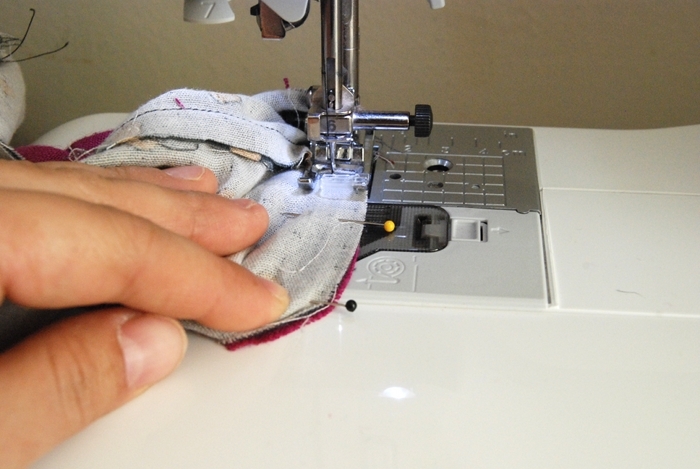 Hand sew the opening shut using a slip stitch. If you want, you can top stitch along the entire outer edge of the coat. 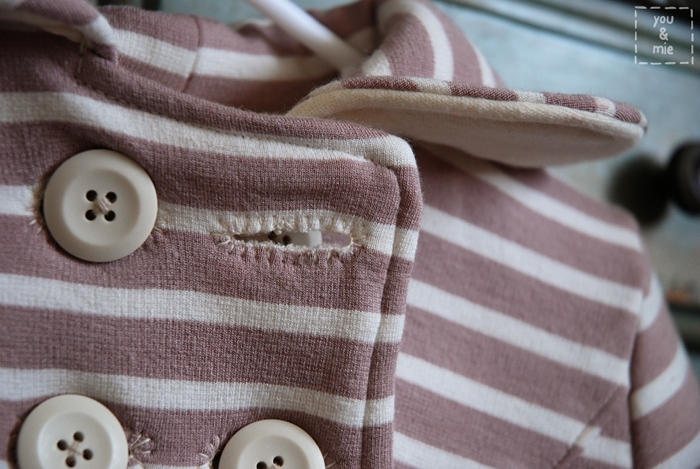 Sew your buttonholes where desired and attach your buttons. You’ll want to either use the same buttons on both sides or at least use the same size buttons. 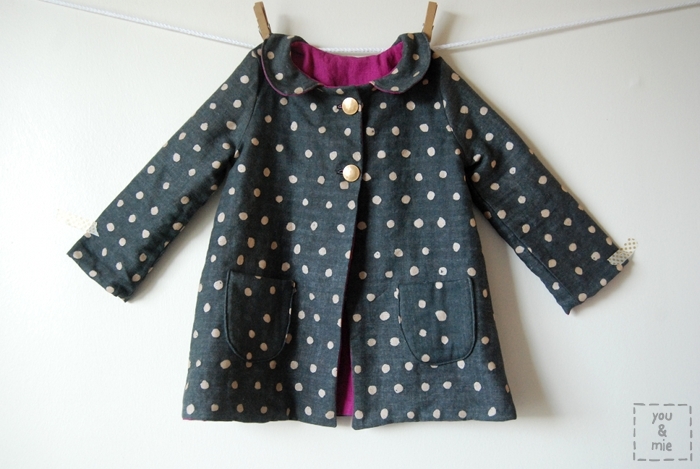 I sewed buttons to both sides of the coat at the same time using one thread. 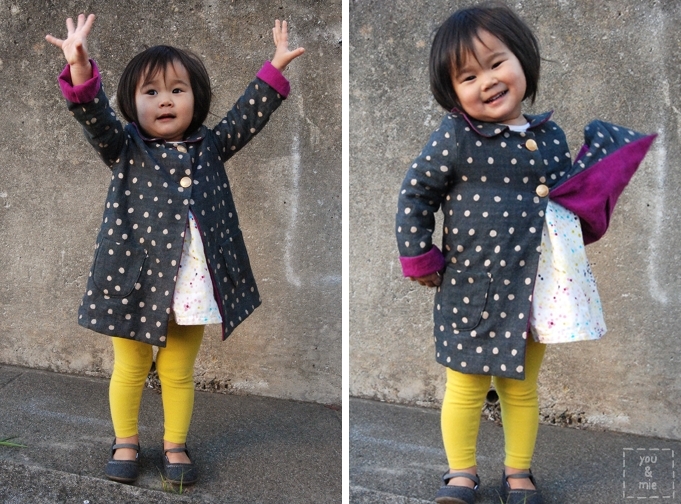 Now your kiddo has two stylish coats in one! I hope you guys have fun with your bodice patterns and are realizing all the endless possibilities a great pattern has. 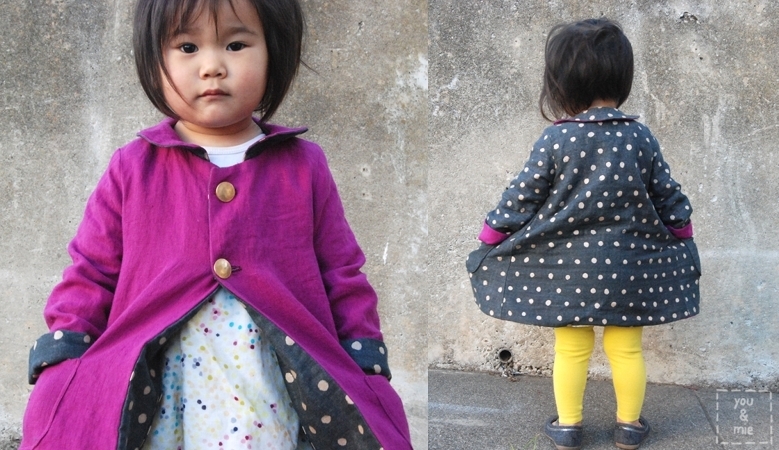 If you sew up a reversible coat using this tutorial (or any from this site), I’d love it if you shared it with us in the you & mie flickr pool! KCWC is officially over! 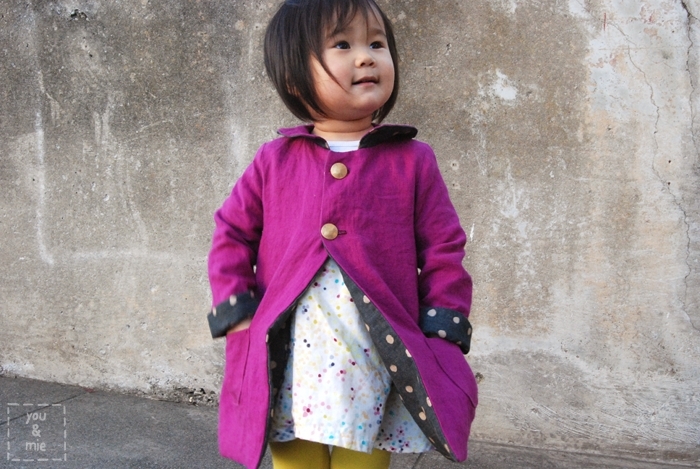 I have one final project to share that I worked on over the weekend – it’s a the Stylish Double Breasted Coat pattern from Dear My Kids. I made the coat in a striped knit (continuing the knit theme of my KCWC collection) and lined it with a really soft cream colored knit. I added a layer of fleece in between and so the coat is SUPER soft, thick and warm. Of course, with the jacket getting so thick, I did have trouble sewing some parts and in fact, I since there was no way of getting the buttonhole foot to work, I decided to hand sew the button holes. 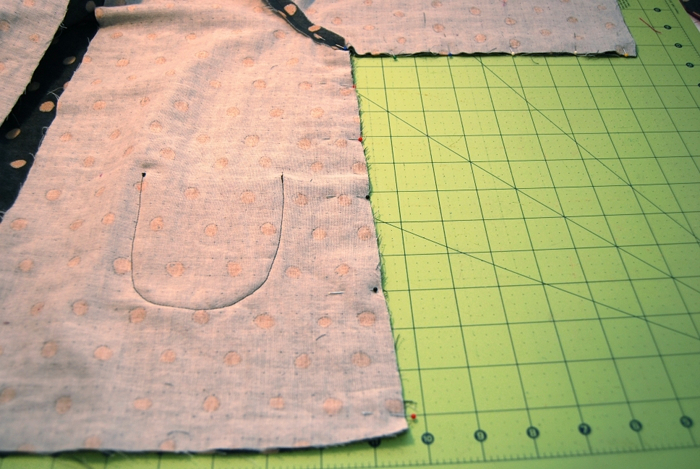 The first tutorial I looked up was a basic blanket stitch around the buttonhole. I kinda like it/kinda hate it. While it’s got a cute hand stitched touch, it also looks a bit messy and frankensteiny. I think this could be really cute on a different type of garment, if done well, in a contrasting thread for a decorative look. I’ll try remember that for later. Anyways, I’m done!! I checked off the 6 main things I had on my KCWC list. I feel a pretty huge sense of accomplishment for not only finishing 6 garments but because I tackled knits – which I’ve always been a bit scared of. I’m by no means a knit expert now, but I feel a bit more confident about sewing with knits and won’t be scared off by them so easily. I finally learned how to use my serger and I’m feeling more confident about using that too. And I LOVE it! I’ll be using it on all my garments from now on. I don’t know why I was so afraid of it! Phew! What a fun week! If you haven’t already, you should definitely go check out the elsie marley flickr pool where everyone has been uploading their KCWC creations. There is so much amazing inspiration there and browsing through all the pictures is my favorite part of KCWC. If you didn’t participate this time, don’t worry, there will be another one in the spring! Thanks so much for hosting, Meg!